From Peak 8, ski down Four O'clock Run and just as you see Main Street, the Park Place condos for sale will be off to your right. It's central to everything in downtown Breckenridge, and the five Park Place buildings share a secluded, outdoor common area with fire pit and hot tubs. Park Place condos were built in the 1970s, but have recently undergone an exterior remodel. The five buildings are staggered on the property, and each one is only three stories, punctuated with stone chimneys and decorated with linear details. Every Park Place condo for sale will have a balcony and a sliding door onto it, as well as a designated parking place. Learn more about living in this Breckenridge residence, or browse the Park Place condominium listings found below. Four O'clock Run is a great way to ski home after a day on the mountain, and if you live in Park Place homes, you get to do just that. The Riverwalk, the Breckenridge performing arts center, are also just across the street. Paths around its lawn lead over the Blue River where you'll find Main Street, and most of the Breckenridge shops and restaurants. Getting to the mountain is easy with free town shuttles that stop across the street and at the bottom of 4 O'clock Run. Resort Quest, the Park Place management company, also runs a free on-call shuttle. They also offer 24-hour front desk, concierge services and daily housekeeping. Convenience and good management add up to better short-term rental income for Park Place owners. Park Place residents can also use the Upper Village pool, which is both indoor and outdoor, has hot tubs, changing rooms, and a sun tanning area. A block north of Park Place is the entrance to Breckenridge open space and the Pence Miller trail that leads to Shock Hill, the Nordic Center and Cucumber Creek Wildlife Preserve. Size (SFLA): 1094 sq. ft. to 1162 sq. ft. Amenities: ski-in, common area with outdoor fire pit and two outdoor hot tubs, Upper Village pool: indoor/outdoor heated pool, guest shuttle, 24 hour front desk, bell service, concierge services and housekeeping, short-term rental income. 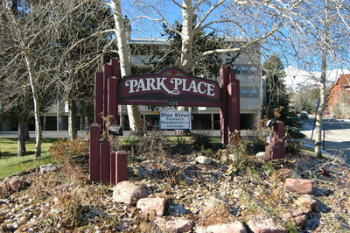 Park Place Condos is located on the southwest corner of 4 O'clock Road and Park Avenue. From the traffic circle on the north side of Breckenridge, take Park Avenue (the continuation of Highway 9) for one-half mile. Park Place Condos will be one block past the stoplight at Ski Hill Road, on the right. The entrance is off 4 O'clock Road. Are you ready to explore your options for condominiums in Park Place, Breckenridge? Send us a message or give us a call at (970) 453-2200 to get the conversation started.